Well for those of you who have been keeping up with my blog, you probably know that the zucchini from my garden has been quite plentiful so far. Like I mentioned in a post a while back, I planned to make zucchini bread. Unfortunately I didn’t get around to it until this weekend. 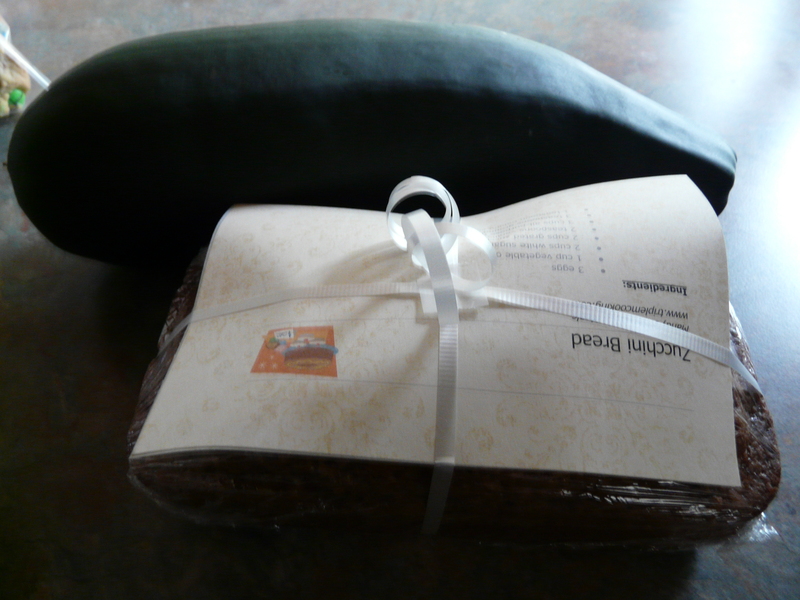 I made a couple of loaves and gave them out to my neighbors along with a zucchini. 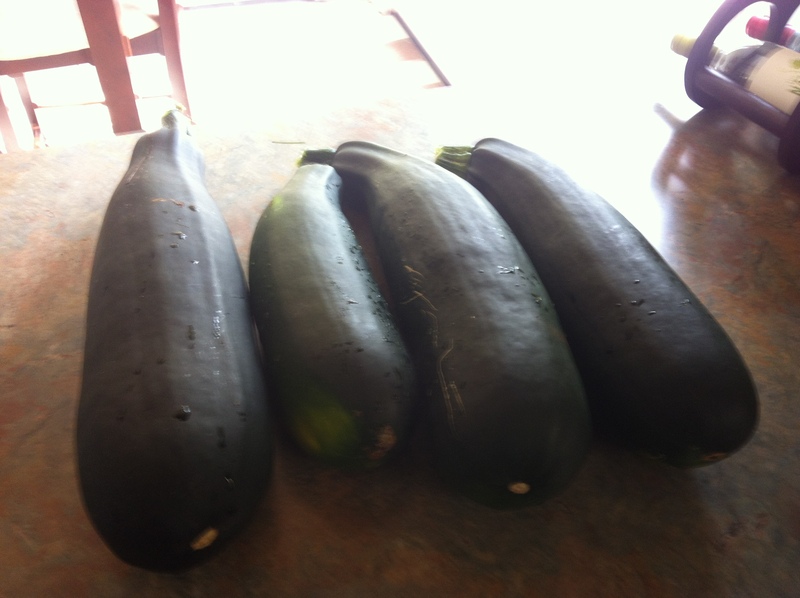 I had so many large zucchini I had to get them out of the garden because they were starting to kill the other plants! I love this zucchini bread recipe, which I originally found on www.allrecipes.com. I’ve tried others but this one is my favorite. It is super moist with just the right amount of sweetness. I have to say zucchini bread is my favorite thing to make from zucchini…of course that’s only because it is a baked good…and I love baked goods! 😉 The recipe makes 2 loaves, so you’ll have some to share if you feel like it! It also freezes well. 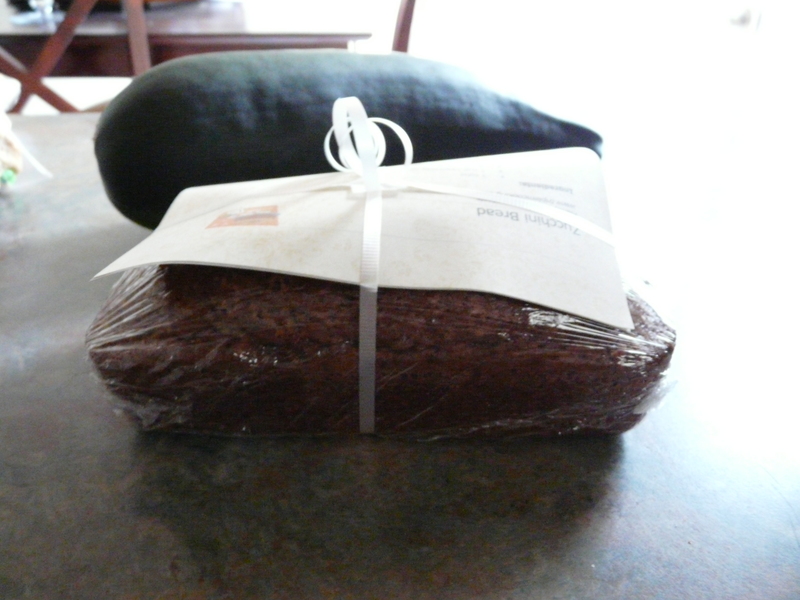 Also, I forgot to take pictures of the bread before I wrapped it up for the neighbors, but you get the point! Preheat the oven to 325 degrees F. Grease two loaf pans and set aside. Combine the oil, eggs and sugar in a mixing bowl. Beat on medium until well combined. Stir in the vanilla extract and the zucchini. Combine all the dry ingredients in a bowl. Add this a little bit at a time to the wet ingredients, mixing on medium. Divide the batter in half and pour into two greased loaf pans. Bake in the preheated oven for 60-70 minutes or until baked through.